High school students are serving as "volunteens" at West Boca Medical Center and getting a jump start on a career in medicine. 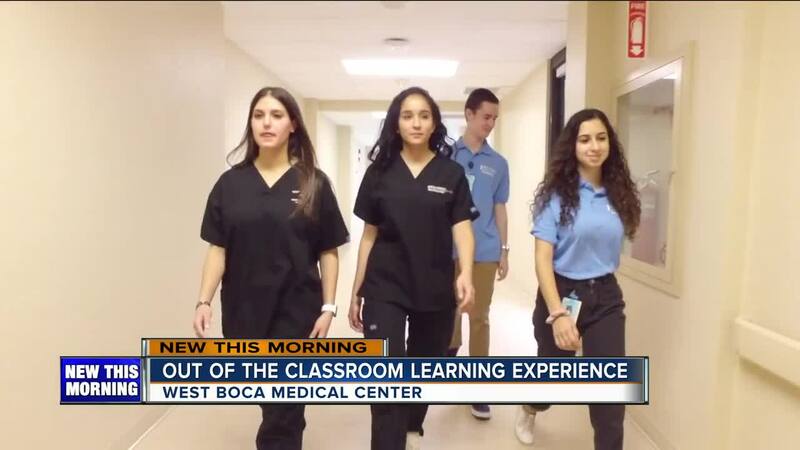 BOCA RATON, Fla — High school students are serving as "volunteens" at West Boca Medical Center and getting a jump start on a career in medicine. The medical career is a competitive one. In our own backyard, there is a program that lets teens get hands on experience at a hospital before they even hit college. Sabrina Levin is a senior at West Boca High School and in the medical academy. Her heart is set on medicine. "Having the background knowledge actually puts me a step ahead," said Levin. She's getting an early start at West Boca Medical Center. Her placement in the medical academy lets her volunteer as a "volunteen." "I also have the confidence with patients, so once I go into medical school, I'll be able to walk into a patient room, introduce myself and start assessing them," she said. This is a win-win for teens and hospital staff. "A hospital is like a team, you have to work together," said Brady Bloom, a sophomore at West Boca High School. They learn the inter-workings of a hospital. In ninth grade, the students start as volunteers and move into clinical rotations junior and senior year. "We've all been there," said Mike Schumacher, a nursing director at West Boca Medical Center. "A lot of it is getting your foot in the door, interacting with patients." Every year about 50 teenagers serve as part of the volunteer and medical academy. Click here if you are interested in applying.